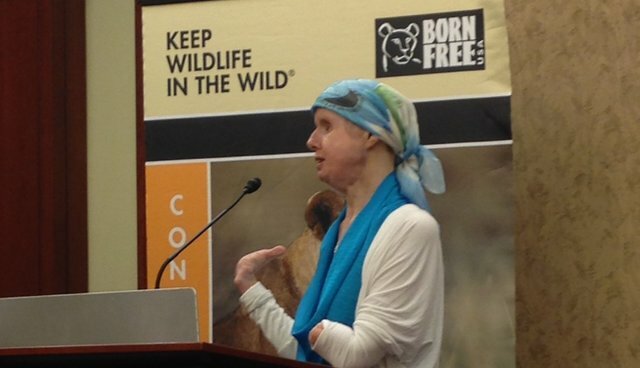 Charla Nash should not be a household name -- at least not because of an attack by a chimpanzee in Connecticut that left her mauled, disfigured, and blind. However, Charla is indeed well-known now, and has made it her mission to ensure that there will never be another incident like the one she suffered. Charla left her Connecticut home in 2009 to assist her neighbor, Sandra Herold, when her 200-pound "pet" chimpanzee escaped. The chimp, named Travis, had a history of violent behavior, and immediately attacked Nash, inflicting devastating injuries. She lost her hands and face – including her nose, eyes, lips, and cheekbones, along with significant brain trauma. Travis was shot, and the community was traumatized. It was heartbreaking, senseless, and preventable. I am not much for clichés, but this was truly an "accident waiting to happen." Travis had bitten before. Travis was well-known in the area. Keeping Travis in captivity was like playing Russian roulette. And for Charla Nash, when the trigger was pulled, there was a bullet waiting in the chamber. For decades, Born Free USA has warned lawmakers and the public of the horrific dangers of keeping exotic animals as pets, and the epidemic of this selfishness and cruelty continues to grow. In 2003 Born Free USA helped pass the Captive Wildlife Safety Act to stop the trade in big cats as pets, including hybrids. No one should have a tiger in their bedroom or backyard. Since then, we have been working hard to enhance that law by adding primates to the list of prohibited species in the exotic pet trade. The Captive Primate Safety Act (H.R.2856/S.1463) passed the House in 2009, and has been reintroduced and is currently is pending in both the Senate and House. We track primate incidents in our unprecedented exotic incidents database, which lists hundreds of other dangerous – and sometimes deadly – encounters between "pet" primates and people. And these are just the ones that are reported. We believe that many are happening every day around this country. Among recent incidents, a six--year-old boy was bitten on his arm by a pet primate in St. Louis, MO, and a pet Javan macaque bit a woman caring for the animal in Paso Robles, CA, causing severe injuries on her arm and finger. These incidents, and Charla's story, highlight a truth that cannot be ignored – these wild animals belong in the wild, not in someone's home. This is an animal welfare AND a public safety issue, where animals and people are being severely injured and killed. Charla Nash represents tragedy -- but also resilience. She has come to Capitol Hill this week to tell her story and to appeal to legislators, the public, and the media to make sure it never happens again to a neighbor, friend, child, or passer-by. It is a truth delivered from harsh experience, and from a powerful voice that will not be silenced. We are proud to support Charla and grateful that she is helping us to put an end to this horror.